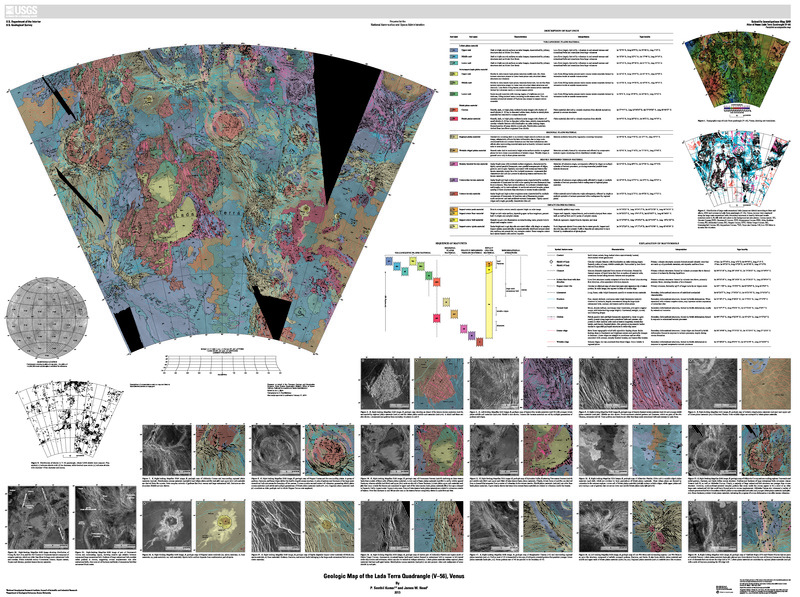 This publication provides a geological map of Lada Terra quadrangle (V56), a portion of the southern hemisphere of Venus that extends from lat 50° S. to 70° S. and from long 0° E. to 60° E. V56 is bordered by Kaiwan Fluctus (V44) and Agnesi (V45) quadrangles in the north and by Mylitta Fluctus (V61), Fredegonde (Vâ57), and Hurston (V62) quadrangles in the west, east, and south, respectively. The geological map of V56 quadrangle reveals evidence for tectonic, volcanic, and impact processes in Lada Terra in the form of tesserae, regional extensional belts, coronae, and volcanic plains. In addition, the map also shows relative age relations such as overlapping or cross-cutting relations between the mapped geologic units. The geology observed within this quadrangle addresses (1) how coronae evolved in association with regional extensional belts and (2) how tesserae, regional plains, and impact craters, which are also significant geological units observed in Lada Terra quadrangle, were formed.